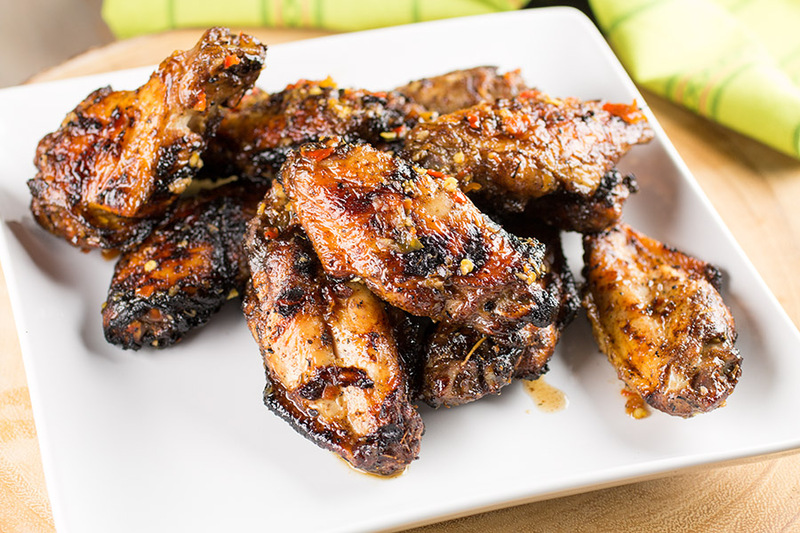 A recipe for chicken wings rubbed with homemade jerk seasoning, grilled, then tossed with your own Jamaican jerk sauce. I couldn’t help myself. I’ve been absolutely jonesing for some chicken wings and I had to make some. No reason to run out to the local wing joint when you can make them at home, especially when you have this freshly made jamaican jerk seasoning rub just sitting there, taunting you, begging you to use it. Come on! How am I able to resist? Alas, I am not able. But I will not chastise myself. 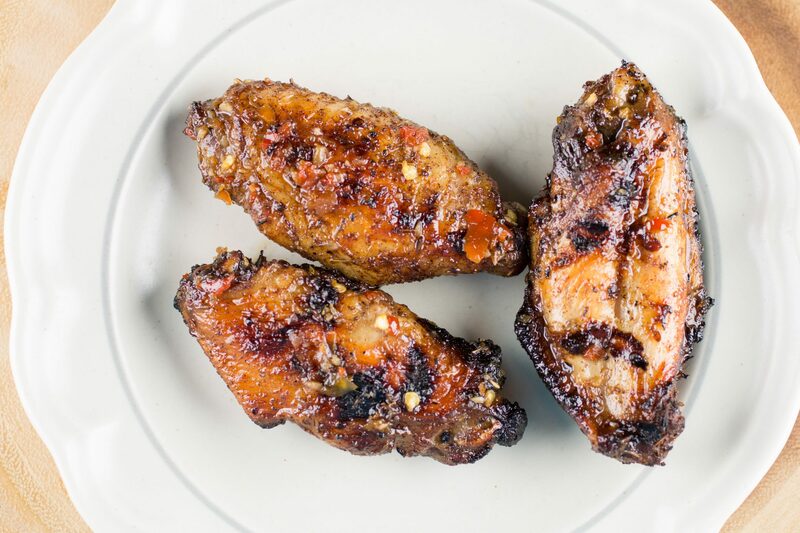 I will, instead, enjoy the heck out of these wings. We’re going Caribbean with this recipe. It’s a double whammy flavor blast, actually triple if you count the brine. I brined the chicken wings to make them extra moist on the inside. Pat them dry and give them a good rub down with your Jamaican jerk seasoning. I made a fresh homemade blend,but feel free to use your favorite brand. Then, I grilled the wings instead of frying them. Nothing against fried. I just prefer them grilled or baked/broiled, depending on my mood. Once they are done, I toss them with a homemade Jamaican Jerk sauce that is crazy delicious. Whammy! Flavor whammy. Just look at them. Get yourself a nice char and go to town. Poor Patty didn’t get to have any of these wings. She was out again on another GNO – Girls Night Out! I’m sure she had fun, but not as fun as I had, enjoying these wings all to myself. Haha! Win! Prepare your sauce first by combining all sauce ingredients in a food processor. Process until smooth. Refrigerate until ready to use. Set the chicken wings into a large bowl. Add salt and cover with water. Cover and refrigerate about 3 hours to brine. Remove and pat the wings dry. Set them into a large bowl and rub the Jamaican Jerk rub into the skins. Get it in there! Heat a grill to medium-heat and grill the wings for 20 minutes, turning once half way through. Keep an eye on them so the skins do not overcook. 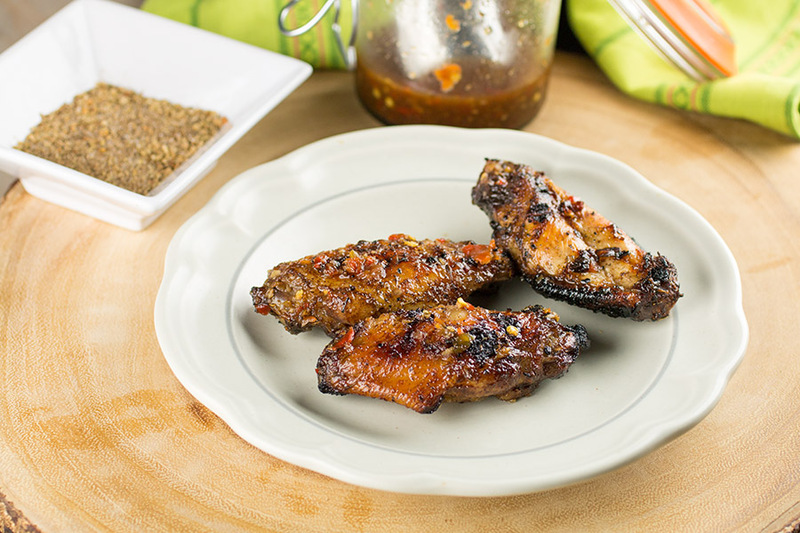 Once cooked through, toss the wings with the Jamaican Jerk sauce and serve.